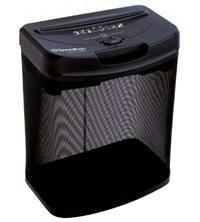 The Swordfish 800XC Cross-Cut Shredder is perfect for home use and will shred up to 8 sheets of paper at a time. With a cutting speed of 2.2m/minute and a shredded particle size of 4 x 45mm this shredder quickly cuts an A4 sheet into about 350 pieces! Security rating for the 800XC 8-sheet shredder (based on size of shredded particle) is DIN P-3 and this means it is suitable for the shredding of sensitive and confidential documents. This is a good level of security when using the shredder to protect you and your family from potential identity theft. The waste bin is 14 litres in size so will hold around 110 shredded sheets. Also, due to the mesh design you can easily see when it needs to be emptied. The lift off head means this is simple to do and in addition to paper, you can also shred credit cards and small staples with this shredder. Other features include: Auto start/stop, off and reverse options; a safety feature whereby the shredder won’t work unless the head is installed correctly; auto power off if the shredder is in danger of overheating and a 225mm feed entry width (suitable for shredding A4 sheets). Duty cycle is 2 minutes shredding, followed by a 15 minute cool down period, allowing you to shred up to 474 sheets per hour. Swordfish recommend oiling your shredder every time your empty the bin and they have a choice of either bottled oil or lubricant sachets to do this. Warranty on the Swordfish 800XC Cross-Cut Shredder is 2 years for both machine and cutting blades. And if you are still undecided as to which of the shredders in the Swordfish range to buy, take a look at our Swordfish brand page where you can compare features and prices on up to 3 shredders at a time.